2016 LINE PREVIEW – SEE WHAT'S NEW FOR FEMALE CYCLISTS. - Terry Peloton. You are here: Home / Pressroom / 2016 LINE PREVIEW – SEE WHAT’S NEW FOR FEMALE CYCLISTS. TERRY TO EXPAND INNOVATIVE APPAREL AND SADDLE LINES FOR ALL CATEGORIES OF FEMALE CYCLISTS IN 2016. Limiting the harmful effects of too much sun exposure is a challenge for all cyclists. TERRY will extend its lightweight UPF 50+ cycling collection in 2016 with the new Soleil Tank and Soleil Top. Made of micropoly spandex, both offer simple, crew neck styling, 3 open rear pockets and come in 2 custom sublimated prints. Available in sizes XS-­‐XXL; $79/$89 (tank/top) suggested retail. Designed for more casual riding and off bike activities, the new, semi-­‐fitted TERRY Tech Tank features moisture-­‐wicking, antimicrobial, heathered fabric with a crew neckline, side hem slits, kitschy graphics and rear patch pocket. Available in sizes XS-­‐XXL; $37 suggested retail. In a first for TERRY, the Bella Prima Bib Short presents combines the technical features of best-­‐in-­‐class Bella Prima Short – luxe Italian, high compression fabric, nonbinding Grip 500 leg bands and soft chamois comfort technology – with convenient, one-­‐piece, halter strap construction. XS-­‐XXL; $140 suggested retail; made in the USA. Short-­‐shorts for female cyclists can be too short which causes saddle chafing and too tight at the leg which leads to “sausage effect”. TERRY’s new Sun Goddess Short solves both of these issues with Grip 500 leg banding and a moderate 6” length. Available in sizes XS-­‐XXL; $89 suggested retail; made in the USA. The Breakaway Knicker is an all-­‐season, calf-­‐length extension of TERRY’s very popular Breakaway Short. 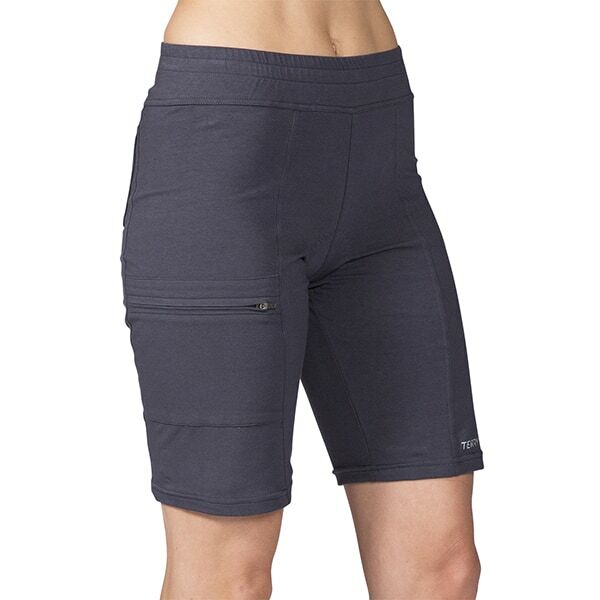 Designed to provide more coverage and light compression, it has the distinction of wide, elastic-­‐free waistband and sculpted paneling that avoids chafe zones. It comes in multiple colors and offers soft chamois comfort technology for all-­‐day riding. Available in black or charcoal; sizes XS-­‐XXL; $89 suggested retail; made in the USA. ¾ sleeve Transit Top made of a luxe Italian satin-­‐ finished, tonally striped fabric. Office-­‐friendly, with a wide boat neckline and hidden side zip pocket. Available in sizes XS-­‐XXL; $89; made in the USA. Dresses can be nearly impossible to wear on a bike but TERRY will introduce a sophisticated solution in 2016. The new Transit Dress is made of a stretchy, wavy-­‐ textured Italian fabric with a cycling-­‐friendly draped neckline and hidden zip pocket. These details take this dress from bike to work with beautiful ease. Available in sizes XS-­‐XXL; $109 suggested retail; made in the USA. Providing an additional level of comfort was a lofty goal in evolving the best selling Butterfly line for 2016. The Butterfly Ti Gel + is the result, with a wider center cutaway and a thin gel layer that adds relief for those riders with the highest degree of sensitivity. Smooth leather cover with perforated butterfly; lightest weight Ti-­‐316 rails; $169 suggested retail; made in Italy. This limited edition Butterfly saddle not only features a wider center cutaway than the classic Butterflies, but enters the stratosphere with a shiny blue dura-­‐tex cover complete with constellation screen print and lightweight manganese. $120 suggested retail; made in Italy. Designed for the elite touring rider, the Liberator X Elite (Liberator Y Elite for men will also be available) has been designed to provide more relief and premium features. Widest cutaway of all Liberators for maximum relief and longest distances; soft, perforated leather with thin gel layer for added comfort; lighter weight Cr-­‐Mo rails. $99 suggested retail. For over 30 years, TERRY has been dedicated to getting more women riding bikes. TERRY apparel and saddles for both women and men are designed to improve the ride for all levels of cyclists and are distributed by better bike shops and major retailers across the US. From serious gear to recreational fun, TERRY positions itself as a brand for all, where technical performance and feminine style ride in tandem.